The inner workings of the human body are complicated, with a comprehensive view of issues such as infection, cancer cells, viruses, and others sometimes difficult to obtain. In spite of such complexity, researchers and clinicians must have a clear understanding of the body’s mechanisms and live cells to ensure the most accurate medical diagnoses, and thus provide patients the most effective and successful treatment. Traditional imaging methods — x-rays, MRIs, CT scans, and the like — are favorably noninvasive, but can only go so far. Currently in use, too, are live cell imaging techniques based on fluorescent labeling or in vitro immunoassays (among others), making identification of cells and their functions easier for biomedical researchers. Now, delving deeper into the body, its live cells, and how they all work is becoming increasingly widespread thanks to emerging nanobiosensing technologies that are offering a closer, clearer look inside. 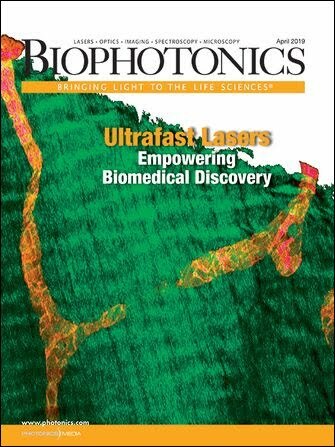 In our cover story — “Nanophotonic Biosensors Expand Live Cell Analysis” — researchers from the École Polytechnique Fédérale de Lausanne examine recent advances in nanophotonics that are not only improving live cell analysis, but also heightening the understanding of complex biological systems (read article). • Science writer Farooq Ahmed takes a look at the groundbreaking power of smartphone spectroscopy. As it continues to enhance biological and medical applications, it’s also making point of care more effective. See “Smartphone Spectroscopy Takes the Lab to the People,” (read article). • In “Miniaturization, Increased Resolution Drive Microscopy’s Future,” (read article), Nirantha Balagopal of Edmund Optics Inc. examines traditional infinite conjugate microscopy as well as improvements to finite conjugate microscopy objective systems that are allowing optical testing methods to decrease form factor while maintaining and boosting performance. • Carlo Alonzo, Ph.D., of Olympus America Inc., compares and contrasts second-harmonic generation and two-photon excited fluorescence microscopy. The two can work well simultaneously in the study of biomolecular assemblies, but differences between them must be considered to establish the best approach. Learn more in “SHG Microscopy Brings Live Cells into 3D Focus,” (read article). • In our BIOpinion column (read article), Giacomo Vacca, Ph.D., president of Kinetic River Corp. and chief science officer at BeamWise Inc., goes deeper into the persistent divide between “incrementals” — those who see true innovation in the intricate details and careful consideration of a technology — and “revolutionaries” — those who believe drastic, game-changing innovation should come before what they describe as trivialities.